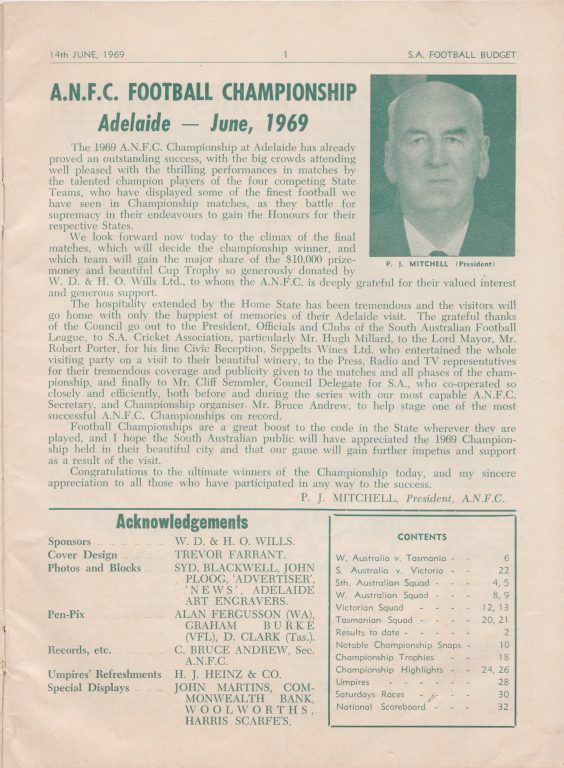 Adelaide hosted the 1969 Australian National Football Council Championship. Over three days, Saturday 7th, Wednesday 11th and Saturday 14th June, the best players from the four major footy state competitions engaged in a round robin format over six matches at Adelaide Oval. Many of these names will still be familiar even to those who did not see them play in the flesh. As with any list from the archives, some of the names were not as well known nationally, but live on as local personalities. 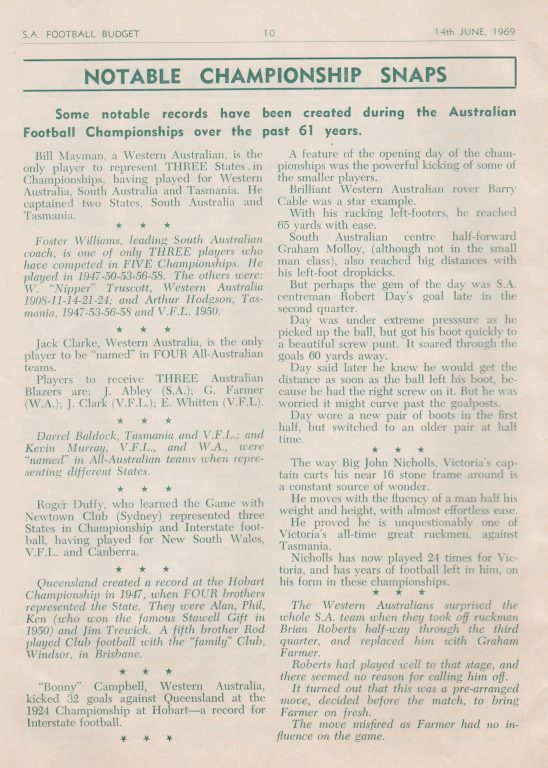 The (unbranded) program from the final day provides us with a snapshot of Australian Football as it was played at its highest level. It also draws attention to the commercial and advertising worlds of the era, the austerity of the post WW2 era still evident in the style and layout used. The contrast with this colourful SANFL Round 1 Budget just eight years later is remarkable. It won’t be apparent to the reader, but this program was an unusual size, B5 or roughly 10”x7”. Apart from the outer leaf, this program used a bottle green-based ink throughout its semi-gloss paper stock. 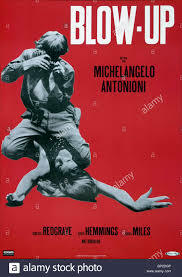 The cover appears to pay homage to a promotional poster for Antonioni’s Blow-Up, but without any murdering being captured in the background. 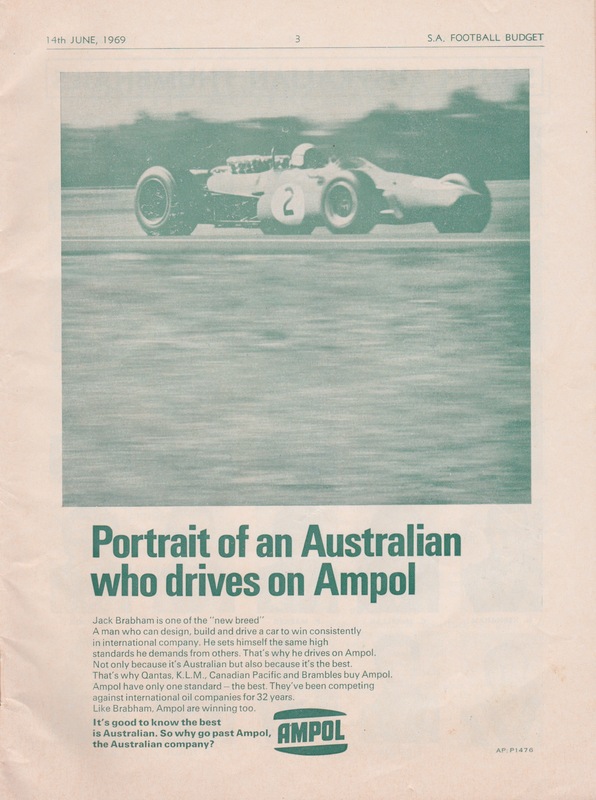 A young Trevor Farrant, a former Norman Gunston writer and a keen current ALP critic, was the artist responsible. 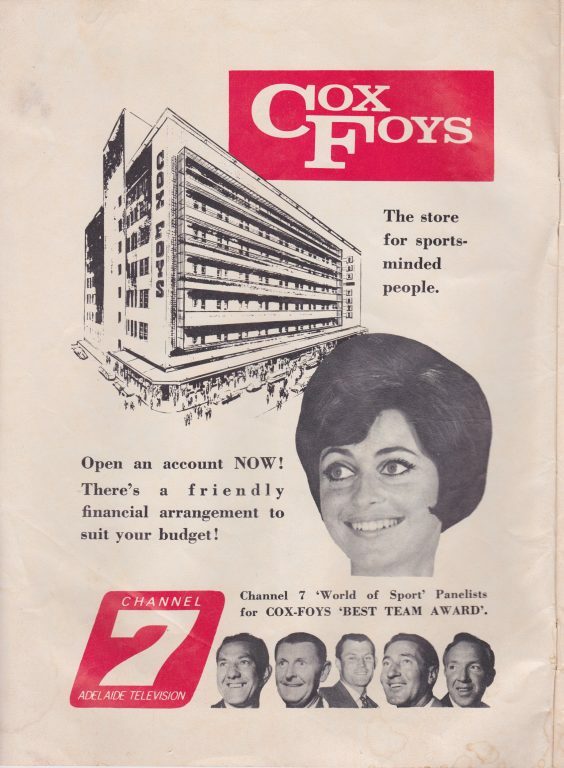 Cox Foys had a terrific “roof top funfair” that afforded good clean pinball and ferris wheel fun until it went belly up and that building took on its incarnation as the Renaissance Centre and Arcade. From the left, the footy panelists were Doug Thomas, Laurie Sweeney, Geoff Kingston, Alan Crabb and Pat Hall. I believe that the token lady there is Angela Davies. There’s a lot to take in here. Victoria’s Perce Mitchell presided over the ANFC, but as he noted, there was heavy reliance on Bruce Andrew. For anyone interested in the history of the sport’s national ruling body, this is a good place to start. 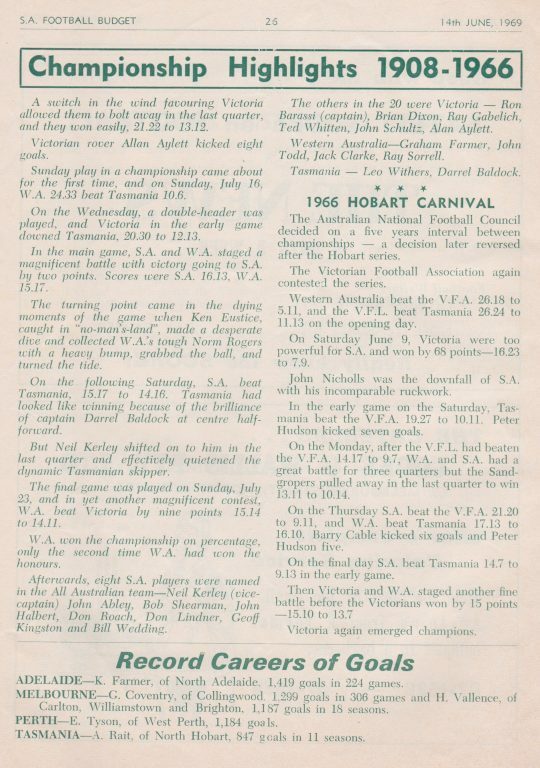 One point not covered by Mitchell’s words is that the VFA, despite playing in the Hobart 1966 Carnival, was excluded from the carnival by the ANFC in 1969 over disagreements regarding VFL/VFA clearance rules. 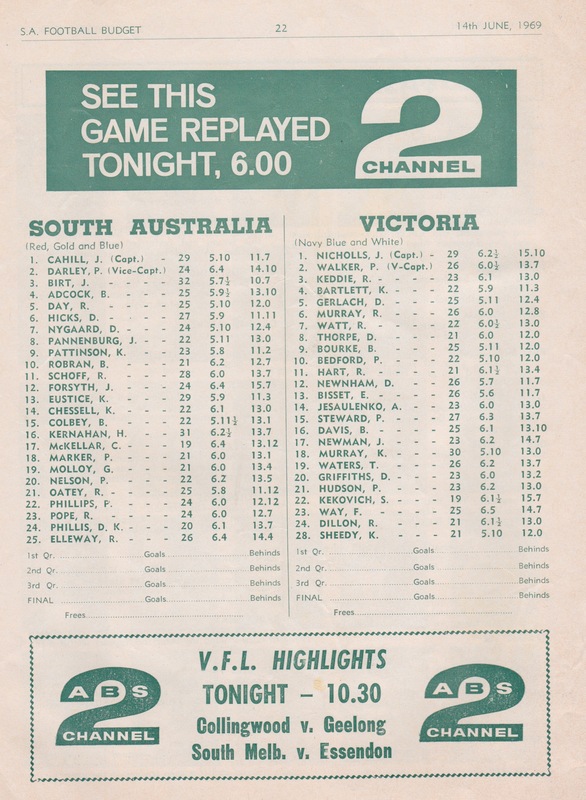 Both SA and Vic were undefeated in the first two rounds. 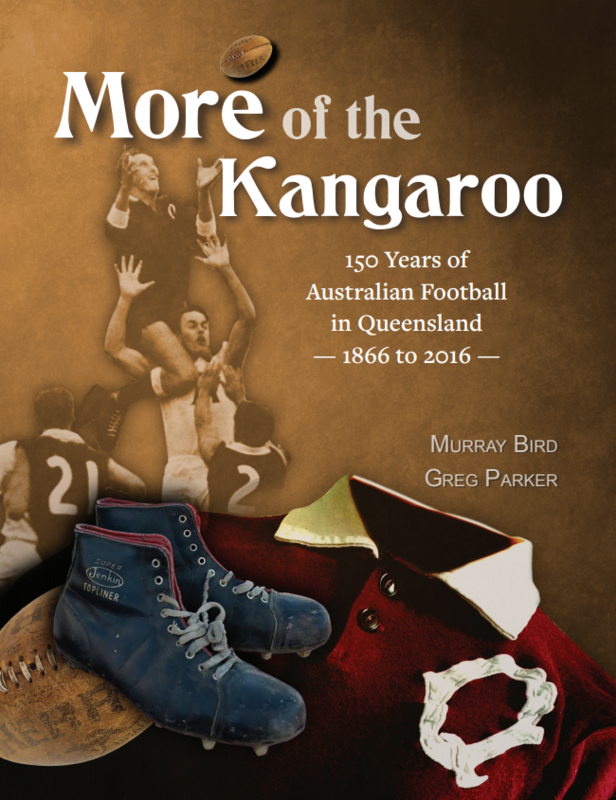 These evocative summaries provide a cavalcade of footy fame: Nicholls, Cable, Farmer, Hudson, Baldock, Hart, Cahill, Robertson et al. But at Carnival’s end, the top-rated players according to the men in white (with black socks) were Graham Molloy and Peter Eakins. These portraits of champions are a vital component of this program, with some gems in the companion “pen-pix” of the locals, despite their brevity. Pannenburg “vigorous tear through utility”, Forsyth “after receiving the rocket from State coach” and Chessell “ Full time Bible Student” for example. Fos Williams was the SA coach, but this was not recorded anywhere here. 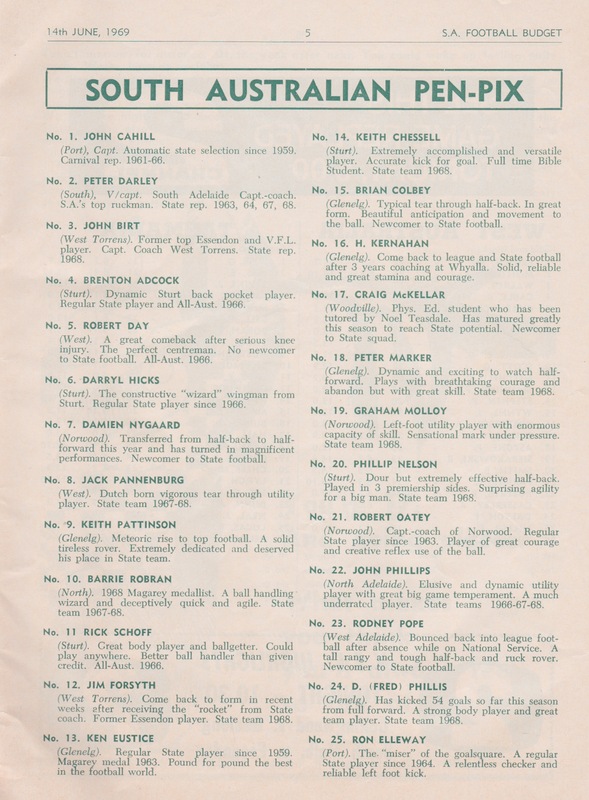 Birt and Forsyth, the two West Torrens representatives, had Essendon in common. 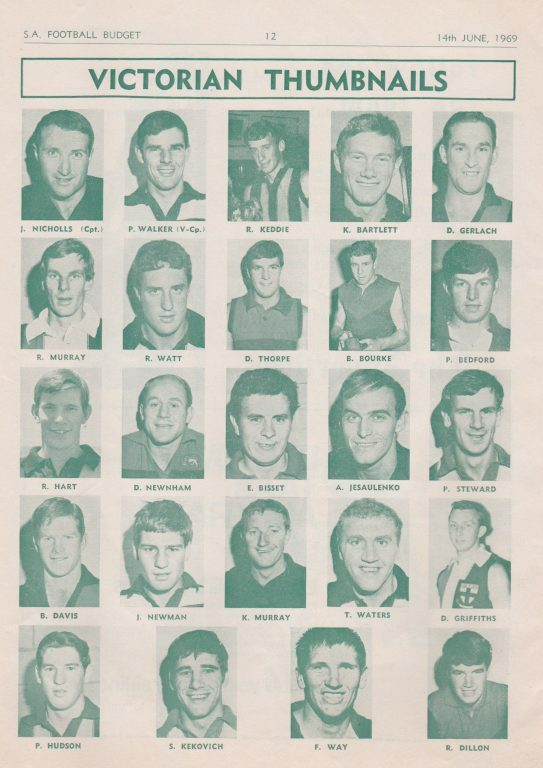 Day, McKellar and Molloy all went across to the VFL in the next few years, but famously, Barrie Robran (and virtually everyone else shown here) stayed put in Adelaide for the rest of their playing careers. John Cahill’s time as Collingwood coach was notable for its non-VFL playing rarity and he was of course the Port Adelaide Power’s foundation coach. 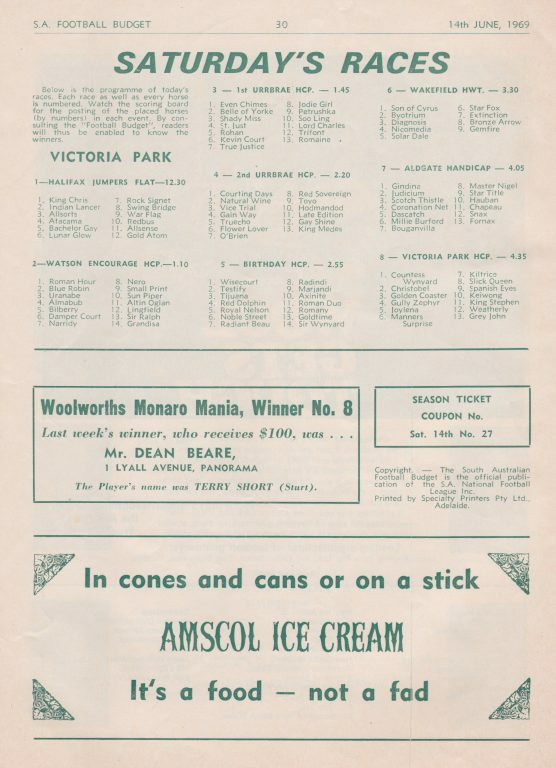 This page also reminds us that most of the state leagues continued throughout the carnival. 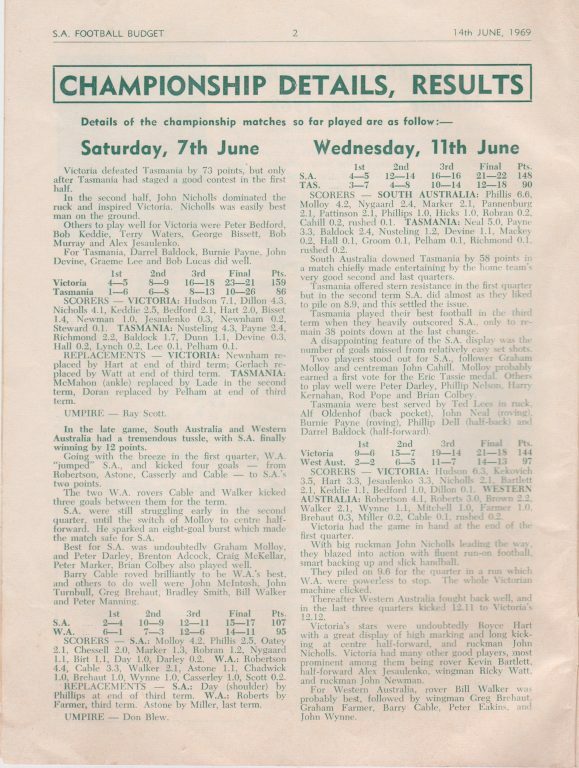 The VFL split one round across three days without awarding Brownlow votes, the SANFL went on hold, the WANFL split one round between the 7th and the 14th June. A curious ad from the pre-Medicare days. 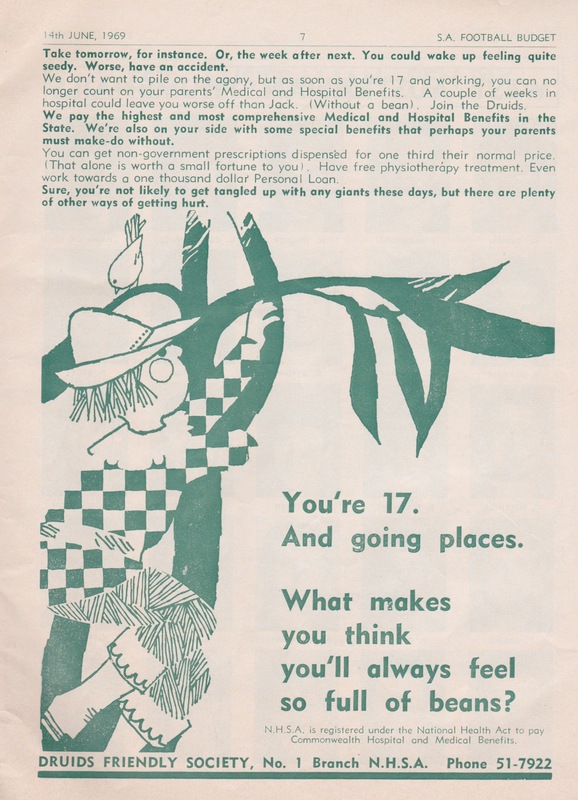 The choice of Jack of Beanstalk fame as the lure for uninsured school leavers in the time of the Vietnam war, imminent moon landing, Go-Set and GTK seems baffling. The WA names immortalised here attest to the player movements of the day. Farmer had returned from the VFL, Roberts had moved from the SANFL (en route to Richmond), Sierakowski was no longer at the Saints, Robertson had a year with South Melbourne in 1966. Hassa Mann was pictured, but injury prevented him from representing his new state. Cable, Casserly, Wynne, Roberts, Melrose, Turnbull and Eakins would all head east in future years. Chris Mitchell went Geelong – East Perth – Geelong – Carlton in his brief career. Derek Chadwick was a remarkable sportsman, representing his state at footy and cricket for almost a decade. Bill Walker remains the only four-time recipient of the Sandover Medal, his pen-pic failing to draw attention to the three that he already had before this carnival. The left hand column refers to the FOUR Trewick brothers – this program from that Hobart Carnival supports this. 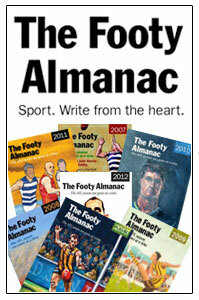 Ken Trewick is well known to Almanac readers courtesy of this piece by John Harms. 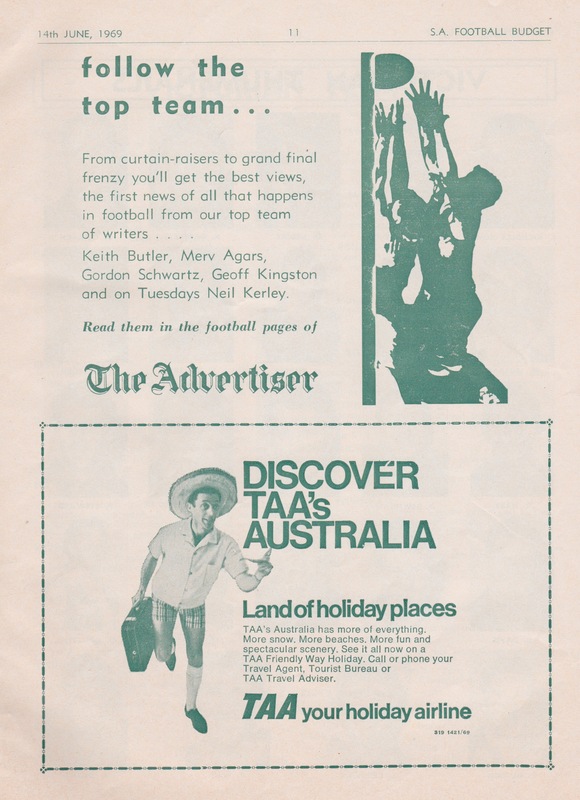 The Advertiser was once a great morning broadsheet, employing the best footy writers in town. TAA was the ABC of interstate flying and should not be confused with the TAB or the TAC. 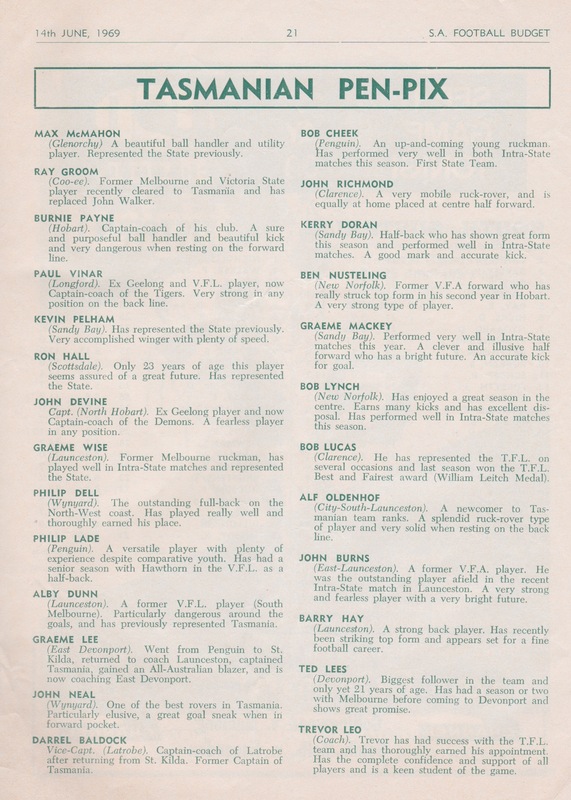 There were only 24 Victorian thumbnails as they strictly selected two players from each VFL club. 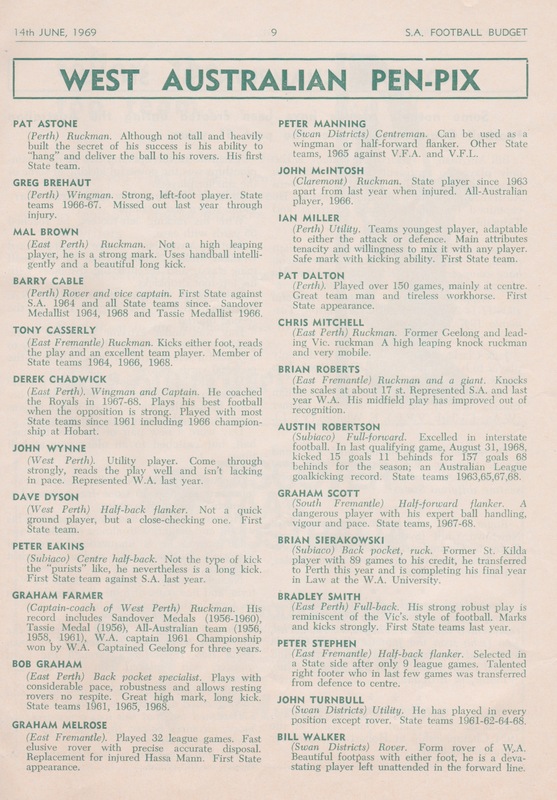 Kevin Sheedy was added to the squad after he had played for Richmond on the first Saturday of the carnival (this tidbit was found in the June 21 Football Record and I haven’t seen it recorded anywhere else). This resulted in an odd mix of superstars and role players. Their pen-pix were rather more fulsome, but their photos rather more rag-tag than the other states. Ron Barassi was coach. Both Keddie and Dillon would represent the Croweaters in the early 70s while Huddo finished his State career in the Apple Isle. 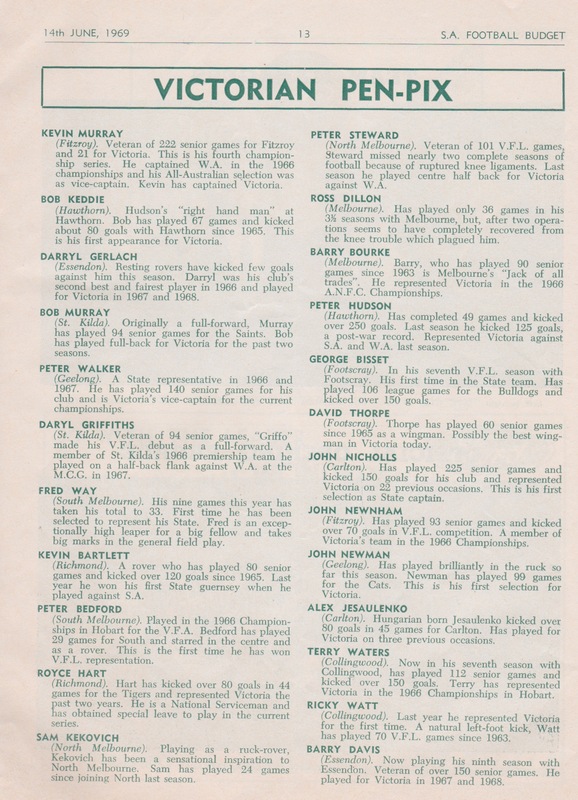 Bulldog Murray representing WA in 1966 is another reminder of the pre State of Origin era. This isn’t the first example of Jezza being given an incorrect birthplace. These days I think of a different part of the anatomy to describe J Newman. The Team Managers photo looks to have been taken at about 4:20pm judging by those blazers. 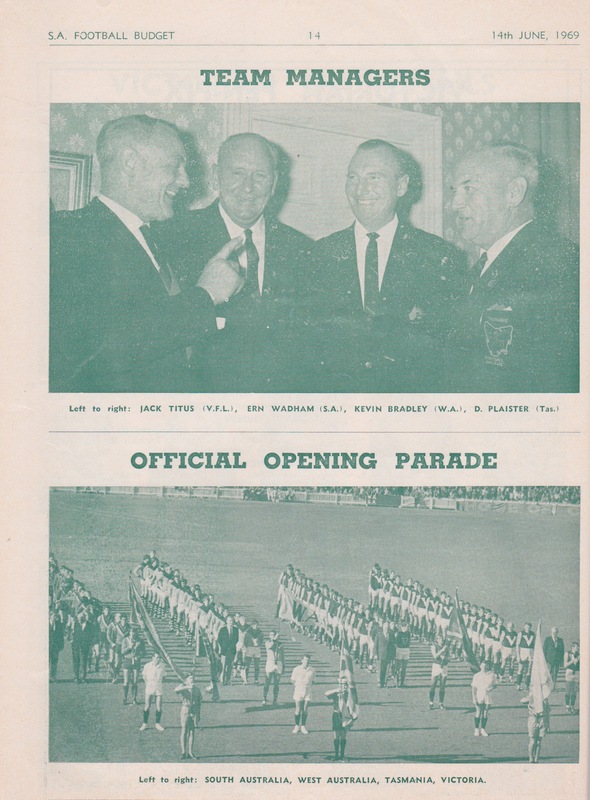 The Official Opening Parade looks fascinating, noting that each state’s umpiring representative also lined up along state lines. 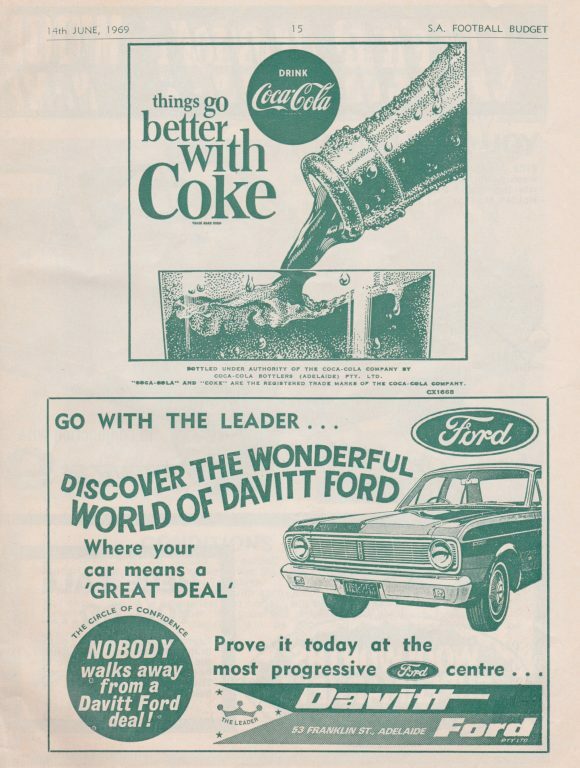 The Coke ad represents an early incursion by multi-nationals with access to superior graphic design skills. That’s Kerls on the left and Harry the Horse in the #4 but the mystery Redleg remains so. Entries close soon. Individually wrapped toilet “tissue” and cheap Japanese cars. Unlike the other states, the Tasmanian coach Trevor Leo gets a mention here, and a fair mention it was too. The Tassie selections were divvied up as 10 from the TFL, 7 from the NTFA and 8 from the NWFU. Future Tasmanian Premier, blow-in Ray Groom, was a late replacement for Walker. Some of these men were known for their mainland forays, Doc Baldock the most notable of course along with John Devine. The Victorian careers of Groom, Vinar, Wise, Dunn, ‘Gypsy’ Lee, Nusteling (VFA), Burns (VFA), Lees and Payne were largely brief ones. Potato farmer John Neal was Scratcher Neal’s dad, as the thumbnail would confirm. But just because they weren’t as widely known north of King Island doesn’t detract from their significance. Jim Forsyth and Big Nick were the heavyweights, John Birt was jockey sized in comparison. These brief highlights appeared on the ABC a while back. Yes, Victoria confirmed its national supremacy, at least on a state league level. The page adds to the mystery that is the correct spelling of Geof/Geoff Motley. The Carnival highlights was written from a distinct SA viewpoint. But it does represent one of the few places that you can obtain this combination of historical scores and commentary recorded in the one place. The Dave Bland piece didn’t elaborate on his brief but fiery time at the Saints. 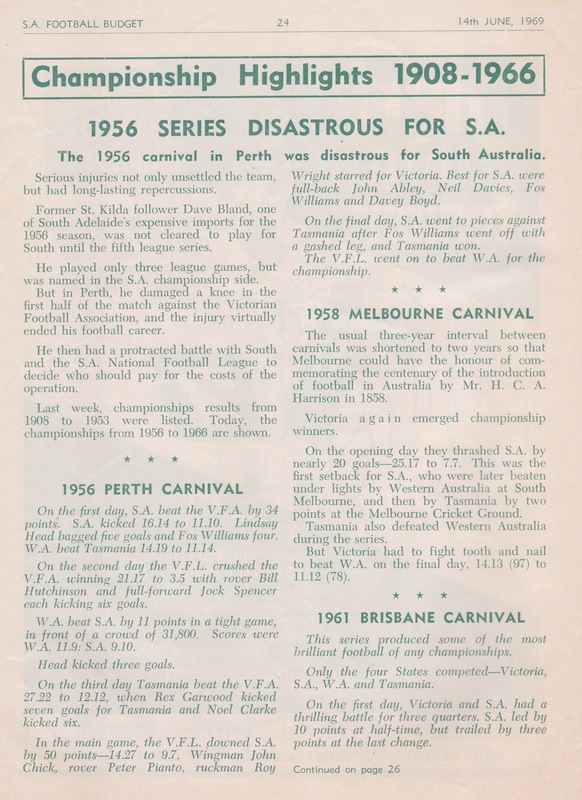 The 1956 carnival was a four day round robin with the VFA competing (therefore the reference to the “VFL” instead of “Victoria”). This was repeated in Melbourne two years later, with the added bonus of the then second-tier competitions, namely “Canberra”, NSW, Qld and the Australian Amateurs playing off for Second Division honours. More ads. More very simply rendered ads. Highlights are continued . The “Record Careers of Goals” was a melange of cities, states and leagues. Don Roach’s book has some great photos: some action, some staged, all classics of the time. Roach was an All-Australian in 1961 and had a long and distinguished football administration career. 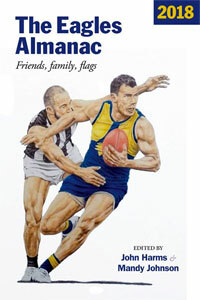 He compiled this book during his time as the SANFL’s first Promotions Manager. That’s Murray Ducker. How he remembered all of those signals, while officiating one-up and bouncing the ball at all ball ups, is a testament to the umpies of the day. 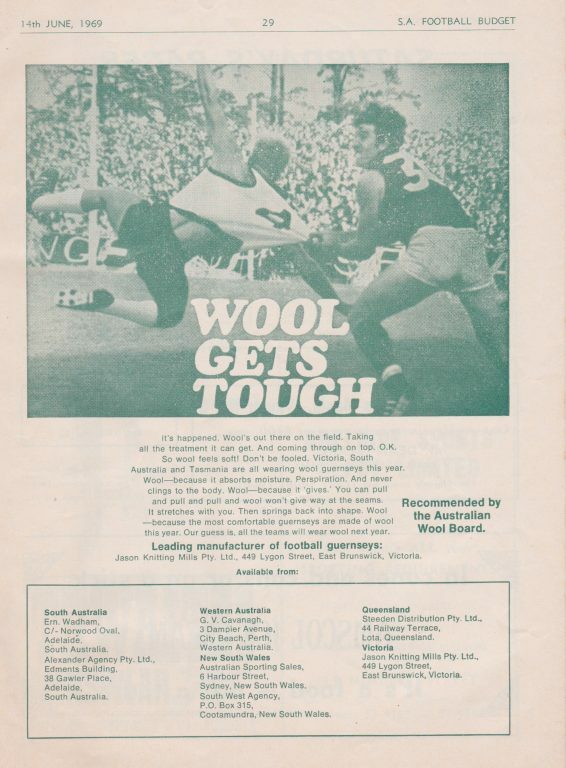 Woollen Footy Jumpers were spruiked by Ern Wadham (who was the SA Team Manager shown here earlier). Bring ‘em back. Kiltrice won the Goodwood Handicap in 1964 and was still there in the Get Out Stakes in June 1969. Amscol’s ads improved greatly with the advent of their Footy Colours. 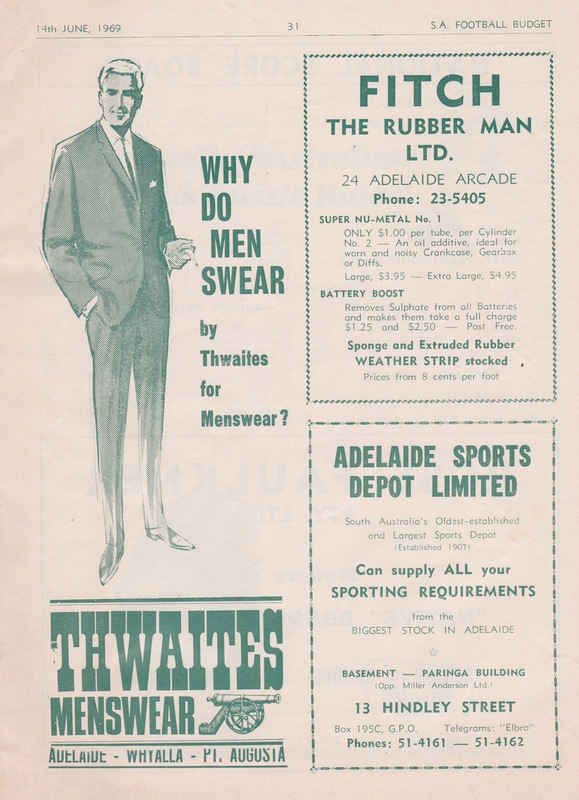 Thwaites was an Adelaide menswear institution as was Adelaide Sports Depot. Fitch The Rubber Man sold all sorts of goods – why make the trip into town for some Battery Boost when you could order it post free? The National Scoreboard covering the nation’s football. Not all of these clubs have survived. Ross Faulkner won the ball wars of ’69. 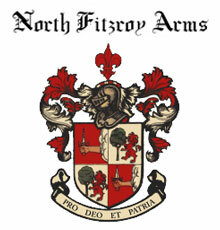 Golden Fleece knew what to call our national game, and it wasn’t ANFC. 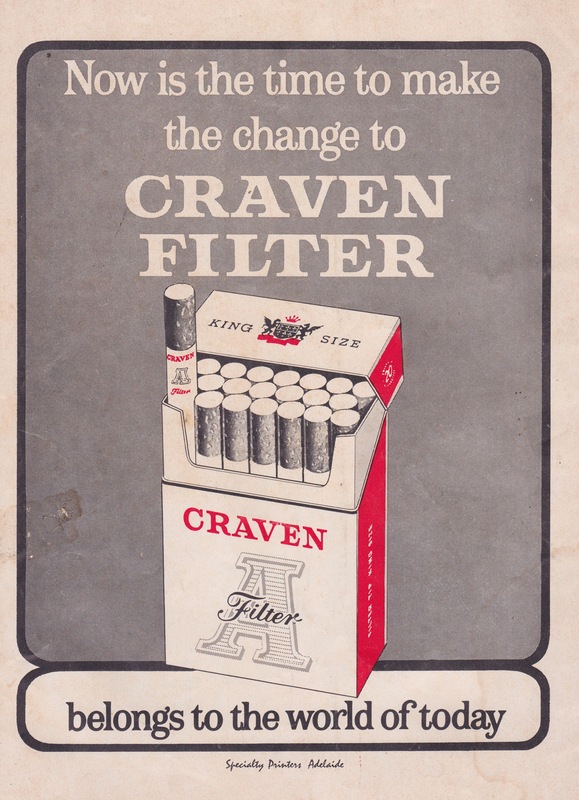 Craven Filter was a Wills brand. Ironic really. They should have done a two-for-one deal with the State Trustee. A heap of research in there Swish, fascinating. The faceless one looks somewhat Oatey shaped, though one could mischievously suggest it is a foreshadowing of Kerley knocking off Nygaard’s face (presumably later) that year. The Ford dealership is now the multistory carpark behind Her Maj. Brilliant work…..i seem to recall the Molloy-Eakins sharing was controversial…..they stood each other in the WA-SA game and Molloy touched him up. Pleased to see Redlegs well represented. Schoff my hero damned with faint praise. We bought toilet paper one roll at a time I note. Rich mine of info to be mined here. Great effort Swish, where do i start? I surmise Westralian captain Derk Chadwick is the same who opened the batting for them for many years. Interesting seeing young Brian”Whale”Roberts photo. Ditto Chris MItchell, in between his two stints at Geelong, then finally Carlton. Great seeing Berrigan’s Fred Way in the Victorian squad. Peter Steward one of the earlier recipients of a knee reconstruction. Tasmania has an interesting Captain/Vice _ Captain pairing. I’m sure they coached against each other during their time in Victoria during the 1980’s. Bob Lynch: Alistair’s father? With your “crow eaters”, Keith Chessell certainly exemplifies the “City of churches”. Graham Molloy went to Melbourne. Like Jim Tilbrook he never measured up over here. Again thanks for the great effort Swish. There’s a lot to take on here, with it bringing back great memories from another era. 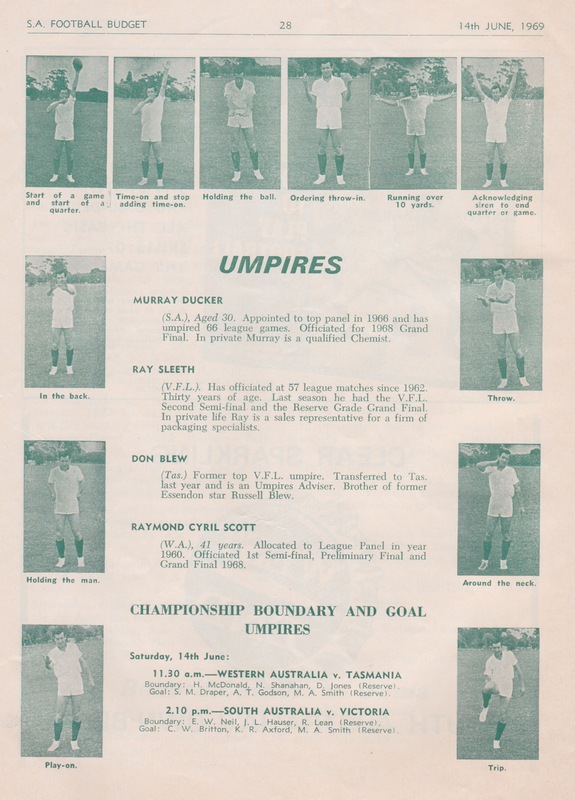 As a kid playing junior footy at Westfields, I had a copy of Don Roach’s book. I obviously didn’t study it enough. Men swear by Thwaites for Mens wear. I remember that from the 70s and 80s. Good to see companies did not rebrand too often in the post WWII days. 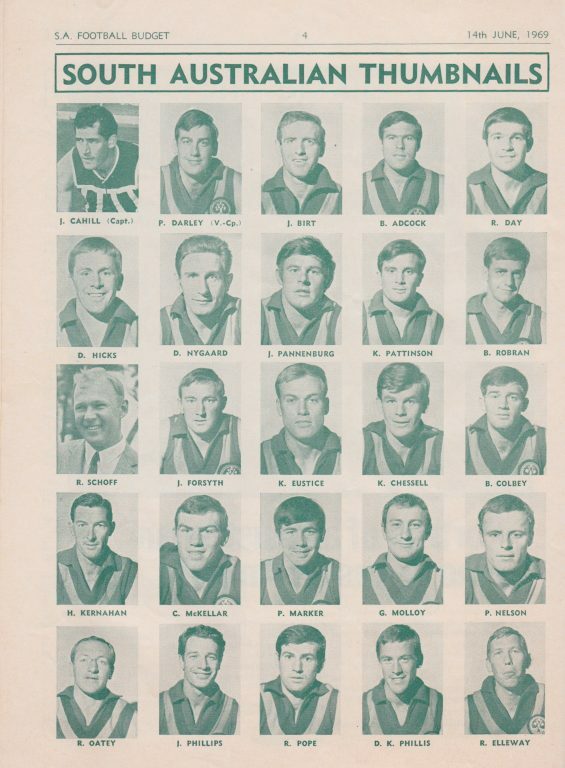 Even the VFL were not that professional all their pen pics have been cobbled from the club’s pen pics using club colours. 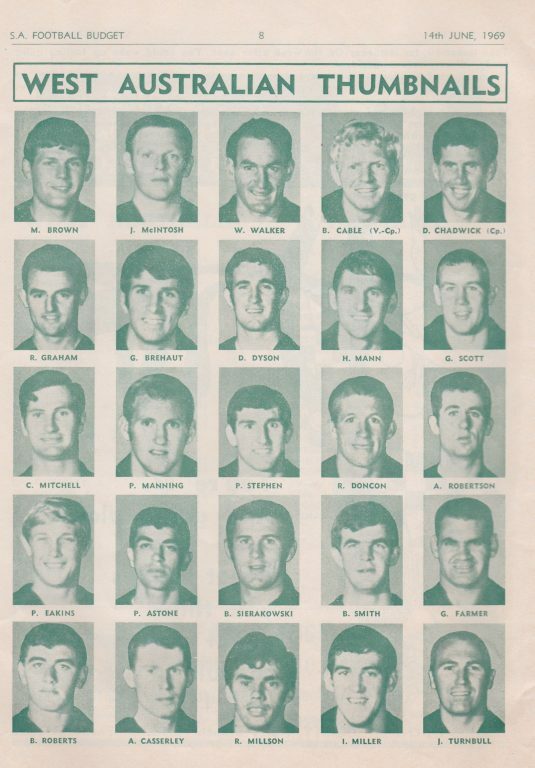 The SA team managed to get all but two players in the state colours. A semi professional effort! Sensational research and presentation Swish. I think I like the ads as much as the footy stuff. Oh to be in the running to win a Monaro ! Every aspirational wog’s dream back in the day. Fitch the Rubber Man? Try selling that these days. Love your work. Phil Carman the redleg player in the Monaro comp?? Were the players uglier then or is just the photography? 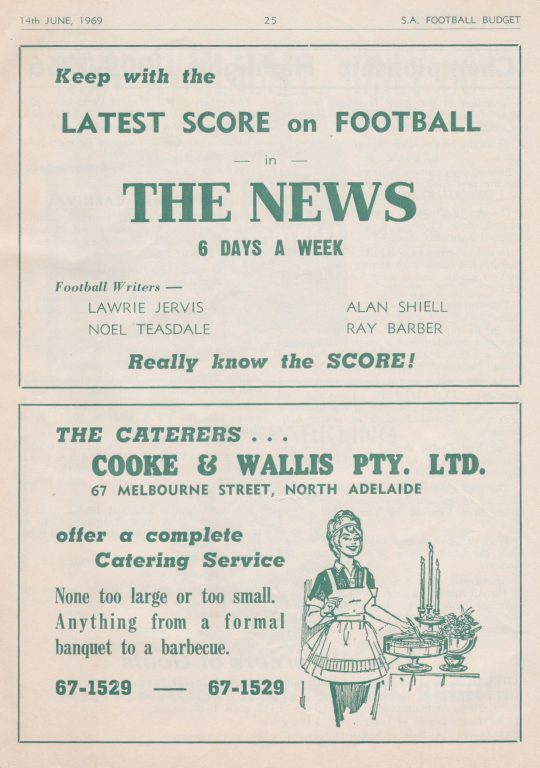 I remember clearly being at the last game of this carnival at Adelaide Oval. They played The Seekers “The Carnival Is Over” on the PA after the last game. Sounded wonderful. Selection of Nygaard presumably pre-dates his attack on Kerley’s elbow. 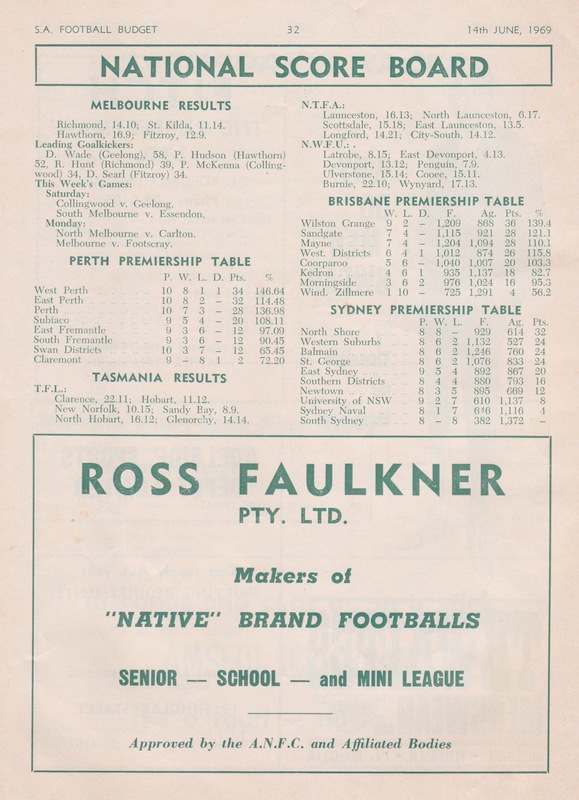 Remarkably, in addition to Ray Groom, Tasmania’s other ruckman, Bob Cheek, also went on to become leader of the State’s Liberal Party (though not Premier). Cracking stuff Swish. The SA/Vic final is my seminal game. Must have driven over from Yorketown and sat in the Edwin Smith Stand (wooden narrow back benches) with my dad and grandad. First half was breathtaking. Great shame that no video of the first 2 quarters survives. Fos Williams had the Croweaters breathing fire (alas not sustainable). Kenny Eustice flattened Daryl Griffiths with a ferocious ‘hip and shoulder’ (probably 6 weeks today). Griffiths slowly got up and went back with the ball from the free kick and promptly kicked the wrong way! We had them on the ropes. 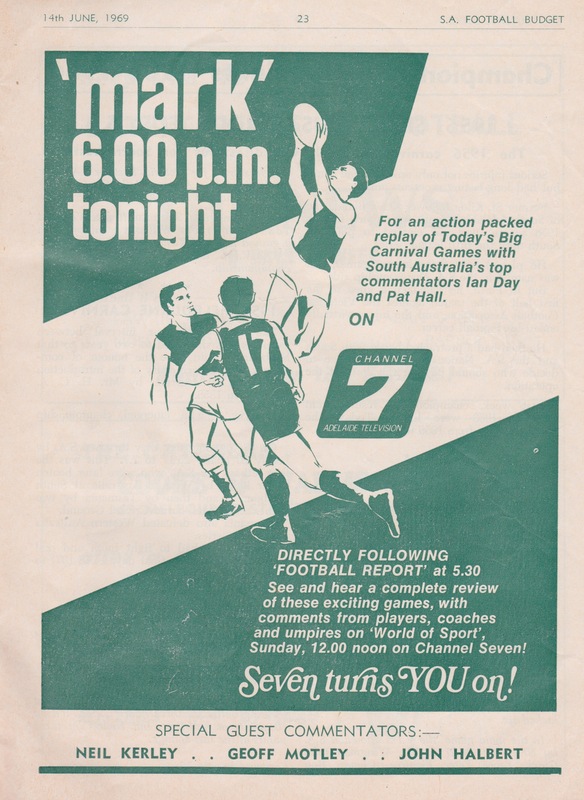 I remember a very young Peter Marker kicking a beautiful goal on the run from out where the 50 is now. Had forgotten that SA stayed with them until half way through the third – and then the Vice kicked the last 7. I remember how deflated I felt. So much effort. So much promised. So little delivered in the end. Dad’s conclusion was that we were as good as them on talent, but they were much stronger and fitter and had tough opponents every week. 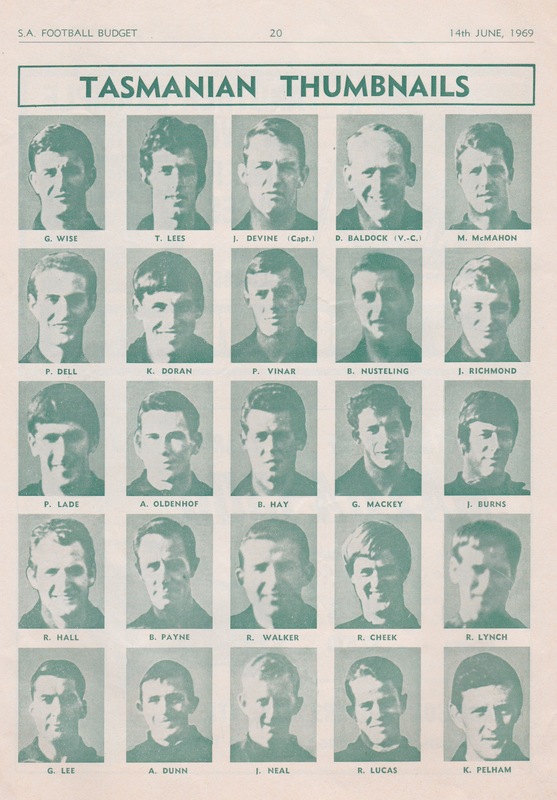 The best SA footballers were less professional and could ‘coast’ in the local comp. Vics were stronger longer. Like Bucko I remember standing on the bench after the match with the streamers and Seekers – almost in tears. Dad had no idea who Pierre-O was. Columbine were caramels. Jack Cahill kicking right foot on one leg (hammy?) in the pre-interchange era! Rulebook would be happy seeing the strong marking young Ross Dillon in his Melbourne days. The publication is a beauty. So much gold to mine. 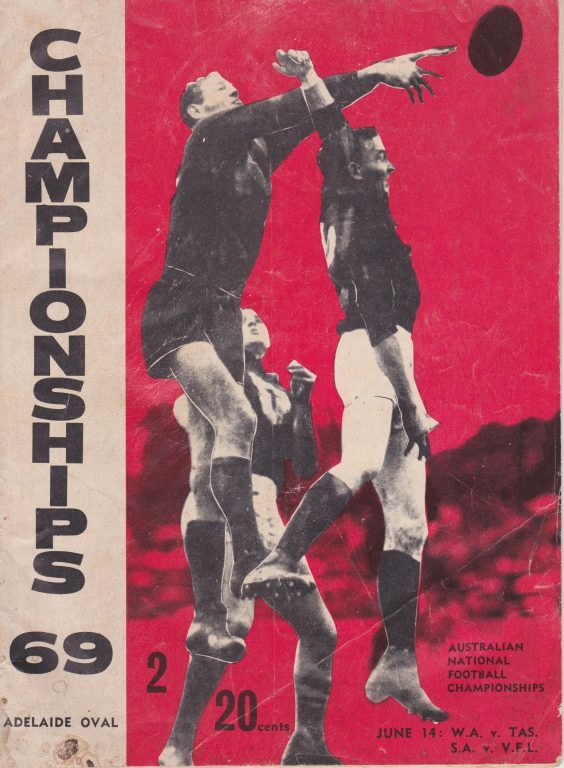 Was it a Budget or a Record – the cover holds no clue of the national moniker for a footy program? Dr GB – can’t be Carman. Debuted in 1970 for the Redlegs. Was chatting to Ray Buckley at the FA GF lunch. He was a second ruck/utility tall. I mentioned Ray Huppatz and he asked if I knew his first ruck in his last season at the Peckers (could have been ’69)? I had no idea – he said McKellar, Blight, Huppatz!! And they finished bottom! He said Ralph ‘zip zap’ Sewer would also have been a star if he had gone to the VFL. WA’s John McIntosh is the father of Eagles dual premiership player Ashley. I reckon there is more and better You Tube footage of the lead-up games – I recall seeing a fair bit of Austin Robertson’s deadly kicking from the tight game against SA the previous Saturday. Dunno why Golden Fleece went broke. I loved their blue and gold colours. Thanks all. I hope that this piece can be a reference point for future footy “scholars”. Gerry – PB has helped out there. 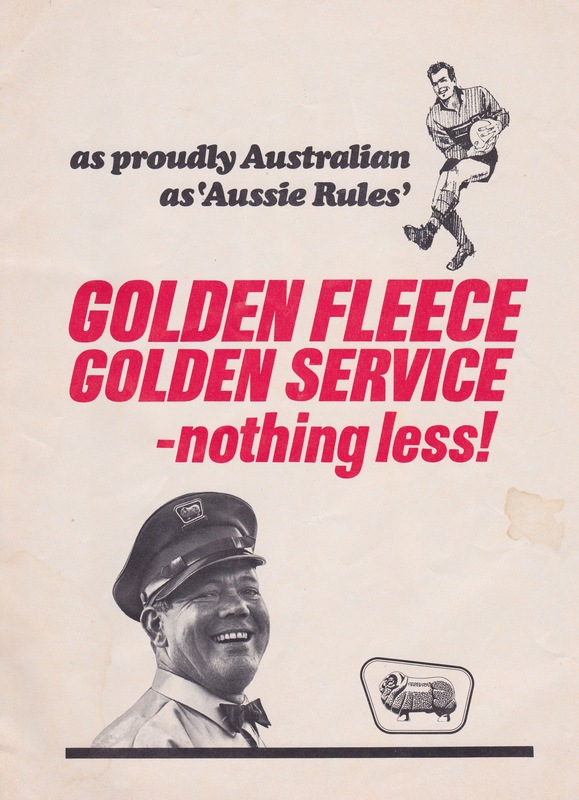 Golden Fleece were prominent Record/Budget advertisers during that period. Rabs – Did Roach’s book have a section on sports medicine? Bucko – Nygaard dined on egg flips for a month after that encounter. Glad that this piece has found someone that was in attendance. I didn’t start going to away games until 1970 from memory and the carnival didn’t seem to have gone down into SA folklore like it should have. Mark D – I should have done more research. Thanks for that. PB – make sure your dad sees this. Thanks for all of that. When I posted the Tassie thumbnails on line recently, I had these responses. 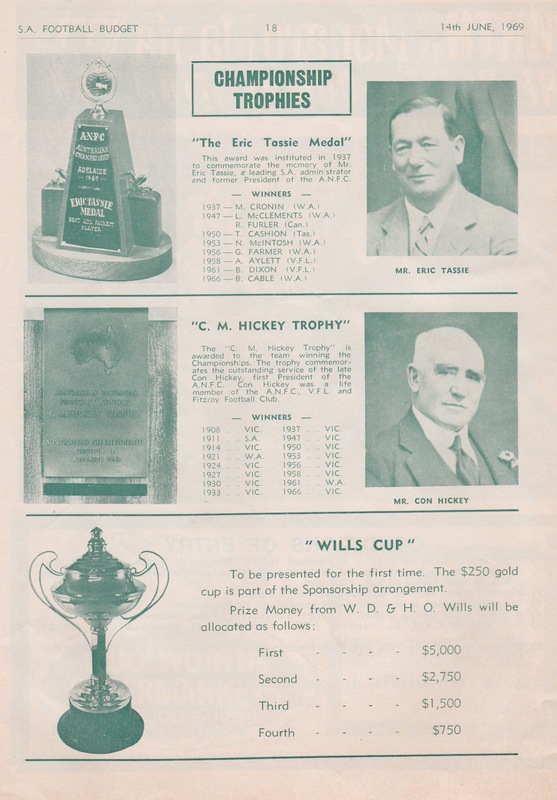 Liahm O’Brien – John Neal is the president of the Wynyard Bowls Club. Bloody tough opponent, wouldn’t want to have come across him on the footy field. Damian Rutledge – some familiar faces … Johnny Richmond, the proprietor at The Shamrock Hotel would always put a couple of jugs “on the house” for my mates and me in mid-late 80s Fri nights. This is just fascinating. Truly the stuff of a long-gone and distant era. My favourite line would have to be the Whale’s pen pic: “Ruckman and a giant”! I’m always amazed at the number of players who went for a stint in the VFL and returned home to continue playing footy. It must have been a case of giving it a go, proving that they were good enough, and going home while they still had plenty to give. Note: Former Church drummer Richard Ploog was from Adelaide, so the family link is more than likely. “So young and so bold!” referring to the Victorian team. This was the one that started the Hatfields and McCoys between the Vics and South Australians. The men from Trendsville and Districts really, really wanted this one, but it was not to be, in spite of the Team of the Century look about the SA mob. It is just that the Vic side had so much talent it is still scary. Thanks for this Swish. A most enjoyable reminiscence. Great research and musings. 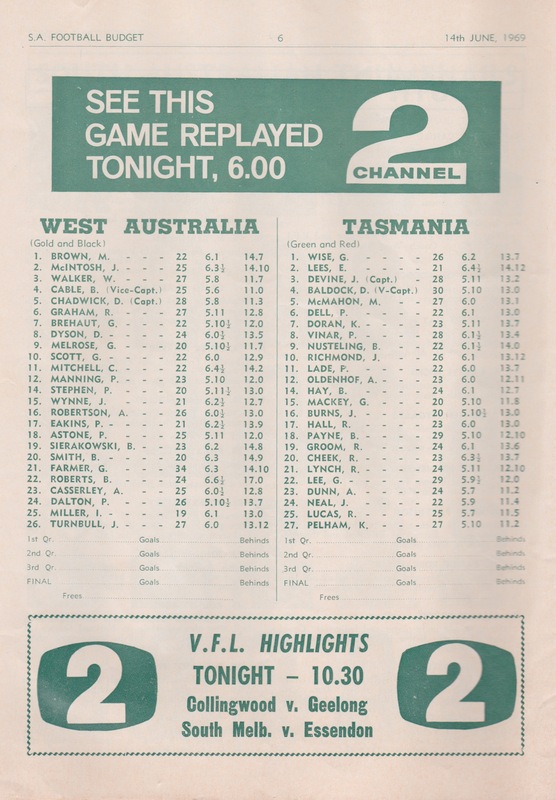 G’day Swish, i was curious if the Bob Lynch in the Tasmanian side was the father of Alistair . I certainly don’t recall him @ Fitzroy, wondering if he was the father. Is there a worse beer than West End ? Southwark ! As a teenager in the late 1970’s i recall the Xmas beer strikes when they’d bring across the South Australian liquid: Horrendous ! The image of the Holden HK Monaro. This was the first Holden V8, though the one pictured in the ad had the boring six cylinder 186 ci motor. ‘Up, up & away with TAA’. They’re long gone. Now part of Qantas. Smokie – I spent a bit of time exploring the Ploog connections, but called it a day. Yeah, Glen! I knew what you were asking, but firstly hadn’t realised that Bob Lynch originated at the Roys when I looked him up further. I had a quick squiz re the Alistair connection, came up blank but left that out of my reply. I’ll keep looking (or one of our Tassie correspondents may be able to help). 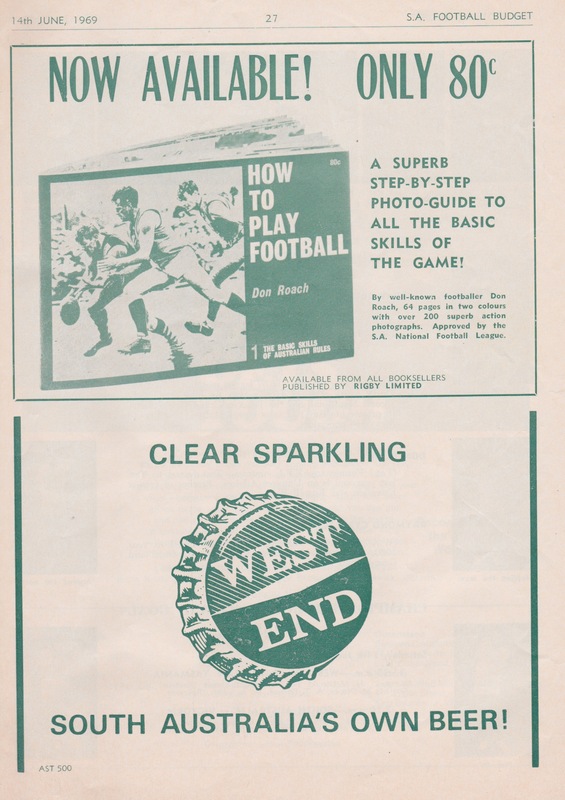 I avoided any mention of West End as it seems to appear in every SA footy publication since the 60s. Thanks for passing it around ‘Book. Molloy is a bit of a forgotten man. Disappointing that Woolies omitted the possessive apostrophe from the bog roll ad. West End sparkling? The Coopers family might have disagreed! Fitch the Rubberman! Surely, the one-stop shop. As with human nomenclature, I reckon the naming of racehorses has become more, well, exotic over time. Keen observations there Mickey. 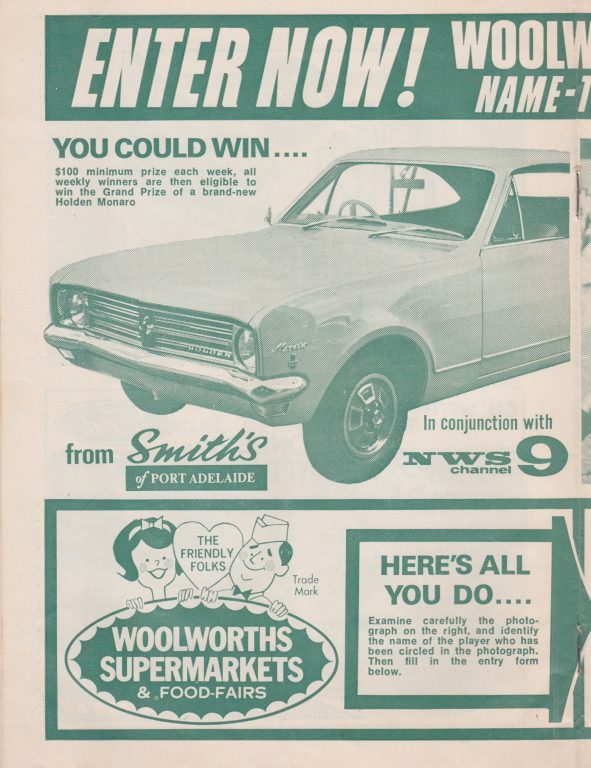 I’m still convinced that my grandfather was Coopers’ only customer in 1969. Very much enjoyed this Swish, a fascinating snapshot of that era where no doubt this tournament was a very big deal. 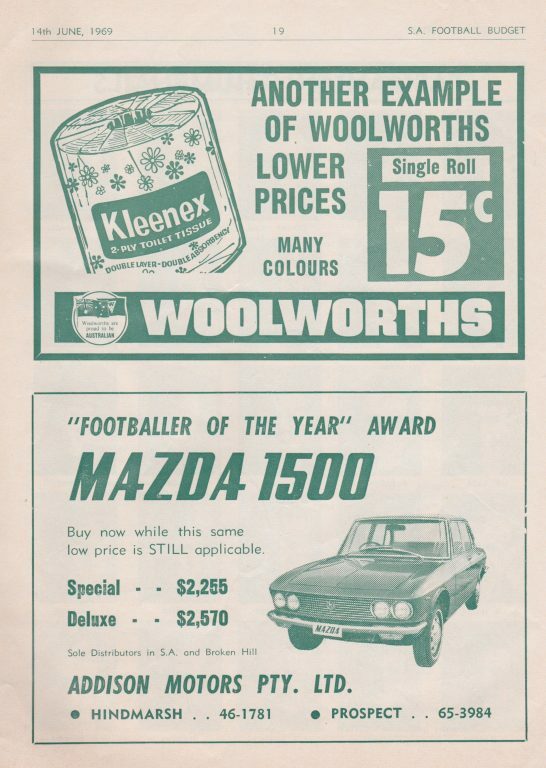 Poor old Tassie, no player selected in the All-Australian team from a four team competition. 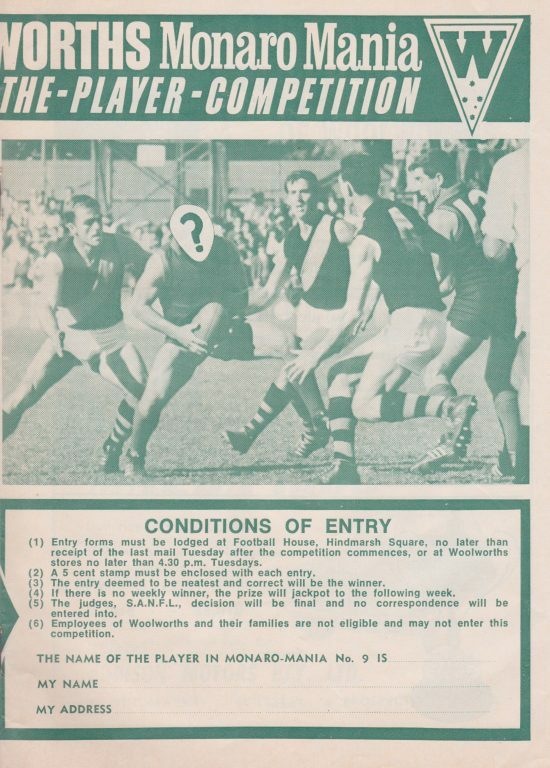 Wonder if there is any link with Tasmania’s P. Lade to the Port Power premiership ruckman? 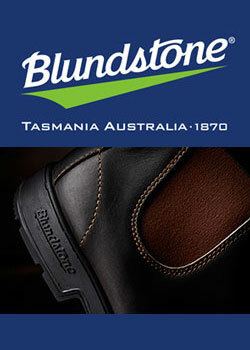 Maybe not given Brendan Lade was from Kangaroo Island.